You know how we're an art family...: it's magic! 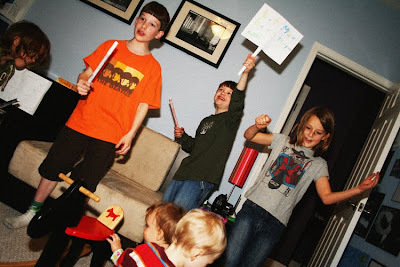 Last night as we had some friends over for dinner and play, the kids decided to put on a magic show for us. 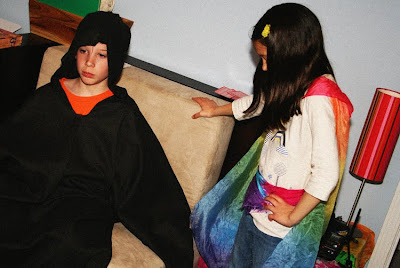 First up, the grim reaper and fairy assistant (you can't make this stuff up!) wowed us with their magical prowess. Next, the whole crew put together a multi-phase act complete with appearing coins, shredded paper that reconnected and handmade paper wands. 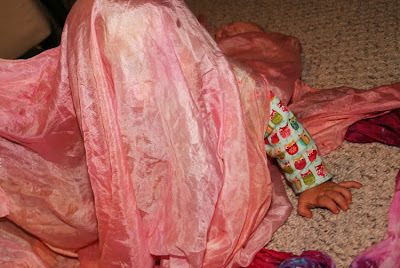 Even the baby "disappeared" under a large playsilk. I so enjoy watching my kids take an interest in something foreign to my own experiences and throw themselves headlong into the process. Some cute websites we found along the way are listed below if any other kids' want to learn some magic. There's nothing sweeter than kids putting on shows. I remember putting great care and planning into elaborate shows with my brothers and friends for my parents, and we still talk about them to this day. Thanks for sharing! Oh I bet that was a really fun night! Looks like a joyous night! 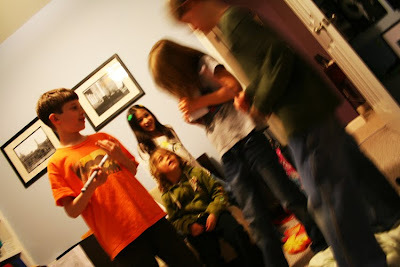 We had a dinner party the other night and the kids put on some crazy little plays for us. All of the adults were in hysterical laughter--good times! Sounds like a splendid evening...friends, food, magic, and play! How cute! I loved "magic" when I was that age-- my personal favorite was writing on stuff with lemon juice, lighting a match under it and watching the "writing" appear. how fun!! my kids do the same thing when we have company. they are always ready to perform a play or dance performance!!! looks like a great night!!! Yesterday when I was cleaning out the rumpus room I found stuff for the magic kit. :) Probably I should show the babes. Too, FUN!!! And what a clever way to angle for a sleepover! Lil entreprenures! What fun! We too used to put on magic shows growing up. Thank you for the memory! What a great show. I love the credits! So something right up my monkeys train of thought! 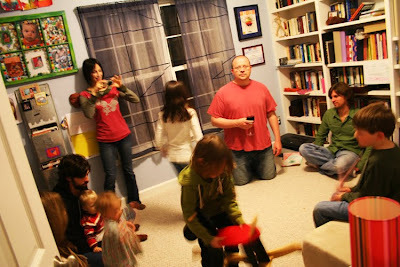 Your house looks so fun, and what great fun that night must have been for everyone!